^ Powers, Shelley; Peek, Jerry; O'Reilly, Tim; Loukides, Mike (2002). Unix Power Tools. ISBN 0-596-00330-7. ^ Stuart, Brian L. (2009). Principles of operating systems: design & applications. Boston, Massachusetts: Thompson Learning. p. 23. ISBN 1-4188-3769-5. ^ a b c d Ritchie, Dennis M. (1984). “The Evolution of the Unix Time-sharing System”. AT&T Bell Laboratories Technical Journal 63 (6 Part 2): 1577–93. http://www.bell-labs.com/usr/dmr/www/hist.html 2018年9月2日閲覧。. ^ McIlroy, M. D. (1987年). A Research Unix reader: annotated excerpts from the Programmer's Manual, 1971–1986 (技術レポート). CSTR. Bell Labs. 139. オリジナルの11 November 2017時点によるアーカイブ。. http://www.cs.dartmouth.edu/~doug/reader.pdf. ^ a b Rik Farrow. “An Interview with Peter G. Neumann”. ;login: 42 (4): 38. https://www.usenix.org/system/files/login/issues/login_winter17_issue.pdf. "That then led to Unics (the castrated one-user Multics, so- called due to Brian Kernighan) later becoming UNIX (probably as a result of AT&T lawyers)." 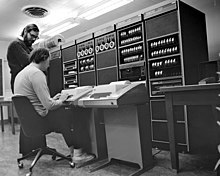 The UNIX System, at The Open Group. The Unix 1st Edition Manuals.